The tragic murder of John Lennon outside his New York apartment in December 1980 was a huge blow to the world of popular music. His wife, Yoko Ono, watched in horror as Mark Chapman fired the fatal shots. A few years later Madonna, destined to become a superstar, made her chart debut – her song ‘Holiday’ was a success on both sides of the Atlantic. Glam rock and Romanticism arrived, and British charts were dominated by stars such as Wham!, Boy George, Duran Duran, The Pet Shop Boys, Michael Jackson, David Bowie and Bryan Ferry. The 1984 famine in Ethiopia prompted Live Aid, a huge charity concert organised by Bob Geldorf, which was a resounding success. Prince Charles married Princess Diana at Westminster Abbey in 1981, and Britain went crazy. Shops were filled with memorabilia, thousands of books appeared to commemorate the event, and most neighbourhoods held street-parties, with the kids in fancy-dress. Diana was a highly popular figure, a fashion icon. Her choice of a full-skirted, romantic-style, silk wedding dress influenced brides for over a decade. There was another Royal wedding in 1986 when Prince Andrew married Sarah Ferguson – once more street parties were in full swing. Suddenly babies were big news, almost a fashion accessory. Prince William was born in 1982, Prince Harry two years later, and Princess Beatrice was born to Sarah in 1988; Princess Anne’s second child, Zara, had made her entrance in 1981, while children were also born to Princess Richard of Gloucester and to Princess Michael of Kent. The Royal family was rapidly increasing. The latest fashion was ‘New Romantics’, encouraged by people such as Vivienne Westwood who designed a swashbuckling ‘Pirates look’, and singer Adam Ant who dressed as a highwayman. We all trotted around in pixie boots and puffball skirts. However, as a complete contrast, many women favoured ‘power dressing’, as seen in the tv soap Dallas, with wide padded shoulders, dominant colours and ‘big hair.’ One of the most maligned garments of all time springs from this era – the shell suit. Originally introduced as a sportswear item, it rapidly spread as a fashion garment, and both young people and ‘golden oldies’ could be seen sporting these bright turquoise, pink and emerald two-piece track suits. This was also the time of the ‘Mullet’, an odd hairstyle with long and short sections, sported by many men including footballer Kevin Keegan and singer Limahl. Perhaps the strangest craze of all was for ‘bonce-bouncers’ – colourful balls or ornaments on springs, worn on a headband. 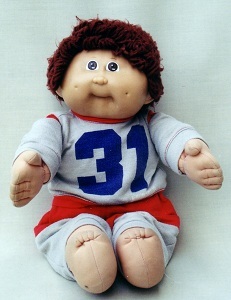 The doll world made dramatic headlines in 1983 when Cabbage Patch Kids first entered the shops. They caused riots, with adults fighting over them and even stealing them from children. Brainchild of Xavier Roberts, the ‘one of a kind’ soft-bodied Kids were promoted as being for adoption, rather than for sale, and prospective parents had to solemnly vow to take care of them. Cabbage Patch Kids are still sold today, and continue to cause controversy between those who love them and those who loathe them. 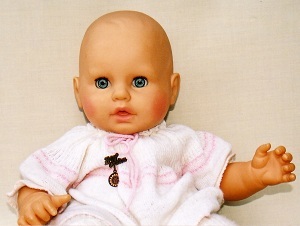 Large dolls, such as those made by the German manufacturer Zapf, were very popular, especially babies and long-haired toddlers. Barbie, the queen of the doll world, celebrated her twenty-fifth birthday in 1984, but didnâ€™t look any older. 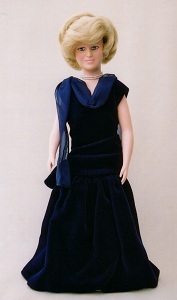 In the UK, Barbie and Sindy were enormous rivals; Pedigree’s Sindy, though introduced in the 1960s, was probably at her peak, at one point sporting a Princess Diana-influenced hairstyle. There were many royal dolls around, notably those produced by Peggy Nisbet to commemorate the Royal Wedding, in both the standard 7 inch models, and a new 18 inch size. Peggy Nisbet also issued a stunning set of vinyl dolls intended to represent the two Princes, William and Harry. These dolls were beautifully dressed, in a range of clothing inspired by the royal wardrobe, though all had the same faces. 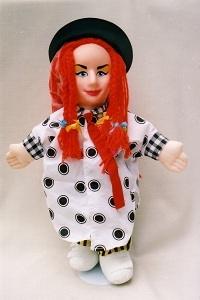 The major change in the doll world was the introduction of small ‘collectables’ dolls. Children were encouraged to accumulate sets of the dolls and their accessories, tapping into a pocket-money treasure trove. 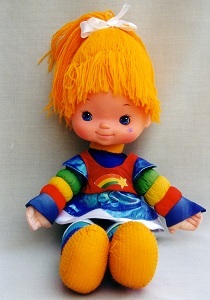 Dolls such as Strawberry Shortcake, Rainbow Brite, Flower Fairies and Lady Lovelylocks were all the rage, as were Care Bears, Ninja Turtles, Transformers, Star Wars figures and My Little Ponies. The toy with the most influence was Rubik’s cube, a hand-held puzzle. The craze instantly spread across the globe and hands clicked and twisted as people attempted to correctly align the coloured squares. In 1984, the Apple Macintosh personal computer was developed, and a year later came Windows – the world would never be the same again. Another invention, pioneered in 1984, was the CD which most people thought would never catch on. Nintendo, Walkmans, Prozac and Karaoke all jostled for attention, but perhaps the most influential gadget, certainly in Britain, was the Breville sandwich toaster! For a few years Briton’s gorged themselves on toasted cheese sarnies. Margaret Thatcher proved she could stand up to threats when she sent battleships to defend the Falklands against the Argentineans, the Berlin wall came down opening up the eastern bloc, and construction began on the Channel Tunnel, enabling trains to travel from Britain to Europe. The beautiful Princess Grace of Monaco was killed when her car veered over the mountainside, while at Lockerbie, in Scotland, a bomb aboard a jetliner downed the plane onto a small town, resulting in hundreds of deaths. Shopping malls sprung up everywhere; the face of Britain was changing, losing its individualness, while a trendy acronym, Yuppie – Young Upwardly Mobile Professional Person – typified a new breed of spending power and wealth. Yuppies worked hard and spent hard. In Britain, the eighties ended with a window on the world – satellite television became available for the first time.